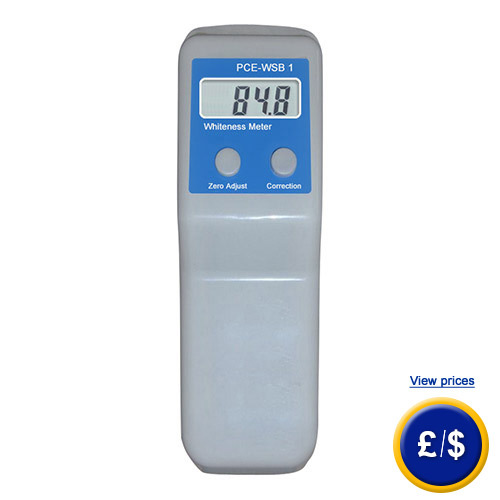 Our whiteness colour meter PCE-WSB 1 measures level of brightness of paper, cellulose and other materials like, for instance, plastics, porcelain and other non-metal products. The level of brightness of plane surfaces is defined through whiteness colour meter by intensity of diffuse reflection as 100. Furthermore, level of brightness of an absolutely black surface is defined through whiteness colour meter as 1. The PCE-WSB 1 is equivalent to international standards ISO 2410 and ISO 3688. Due to ergonomic design of the whiteness colour meter it is comfortable to work with as well as easy to operate owing to its few buttons. According to the fact that our whiteness colour meter runs through batteries, it can be taken anywhere and takes that measurment that is needed at exactly a certain time place; additionally the high-resolution display allows an easy reading of determined values. 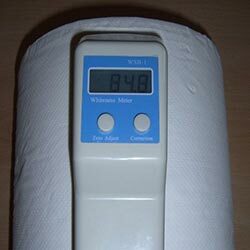 With this whiteness colour meter all measurements of all sorts of white materials is possible. Especially, on paper cellulose, plastics and porcelain these measurements can be taken very good. The carrying case included in delivery, the compact form, as well as the light weight of our whiteness measuring instrument allow a location-independent measurement and after this comfortable measurement all data can be read out. 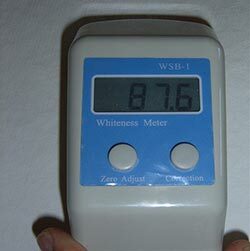 The whiteness colour meter captivates due to its accuracy on several measurements as well as its very small energy consumption during such measurement. If there are any questions about the whiteness colour meter PCE-WSB 1 have a look at the technical specification below or call: UK customers +44(0) 23 809 870 30 / US customers +1-410-387-7703. Our technicians and engineers will gladly advise you in all whiteness colour meters and all products in the field of measuring instruments, regulation and control and scales.